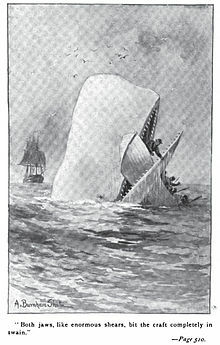 In connexion with the monstrous pictures of whales, I am strongly tempted here to enter upon those still more monstrous stories of them which are to be found in certain books, both ancient and modern, especially in Pliny, Purchas, Hackluyt, Harris, Cuvier, &c. But I pass that matter by. But, taken for all in all, by far the finest, though in some details not the most correct, presentations of whales and whaling scenes to be anywhere found, are two large French engravings, well executed, and taken from paintings by one Garnery. Respectively, they represent attacks on the Sperm and Right Whale. In the first engraving a noble Sperm Whale is depicted in full majesty of might, just risen beneath the boat from the profundities of the ocean, and bearing high in the. air upon his back the terrific wreck of the stoven planks. The prow of the boat is partially unbroken, and is drawn just balancing upon the monster's spine; and standing in that prow, for that one single incomputable flash of time, you behold an oarsman, half shrouded by the incensed boiling spout of the whale, and in the act of leaping, as if from a precipice. The action of the whole thing is wonderfully good and true. The half-emptied line-tub floats on the whitened sea; the wooden poles of the spilled harpoons obliquely bob in it; the heads of the swimming crew are scattered about the whale in contrasting expressions of affright; while in the black stormy distance the ship is bearing down upon the scene. Serious fault might be found with the anatomical details of this whale, but let that pass; since, for the life of me, I could not draw so good a one. In the second engraving, the boat is in the act of drawing alongside the barnacled flank of a large running Right Whale, that rolls his black weedy bulk in the sea like some mossy rock-slide from the Patagonian cliffs. His jets are erect, full, and black like soot; so that from so abounding a smoke in the chimney, you would think there must be a brave supper cooking in the great bowels below. Sea fowls are pecking at the small crabs, shell-fish, and other sea candies and maccaroni, which the Right Whale sometimes carries on his pestilent back. And all the while the thick-lipped leviathan is rushing through the deep, leaving tons of tumultuous white curds in his wake, and causing the slight boat to rock in the swells like a skiff caught nigh the paddle-wheels of an ocean steamer. Thus, the fore-ground is all raging commotion; but behind, in admirable artistic contrast, is the glassy level of a sea becalmed, the drooping unstarched sails of the powerless ship, and the inert mass of a dead whale, a conquered fortress, with the flag of capture lazily hanging from the inserted into his spout-hole. The natural aptitude of the French for seizing the picturesqueness of things seems to be peculiarly evinced in what paintings and engravings they have of their whaling scenes. With not one tenth of England's experience in the fishery, and not the thousandth part of that of the Americans, they have nevertheless furnished both nations with the only finished sketches at all capable of conveying the real spirit of the whale hunt. For the most part, the English and American whale draughtsmen seem entirely content with presenting the mechanical outline of things, such as the vacant profile of the whale; which, so far as picturesqueness of effect is concerned, is about tantamount to sketching the profile of a pyramid. Even Scoresby, the justly renowned Right whaleman, after giving us a stiff full length of the Greenland whale, and three or four delicate miniatures of narwhales and porpoises, treats us to a series of classical engravings of boat hooks, chopping knives, and grapnels; and with the microscopic diligence of a Leuwenhoeck submits to the inspection of a shivering world ninety-six fac-similes of magnified Arctic snow crystals. I mean no disparagement to the excellent voyager (I honor him for a veteran), but in so important a matter it was certainly an oversight not to have procured for every crystal a sworn affidavit taken before a Greenland Justice of the Peace. In addition to those fine engravings from Garnery, there are two other French engravings worthy of note, by some one who subscribes himself "H. Durand." One of them, though not precisely adapted to our present purpose, nevertheless deserves mention on other accounts. It is a quiet noon-scene among the isles of the Pacific; a French whaler anchored, inshore, in a calm, and lazily taking water on board; the loosened sails of the ship, and the long leaves of the palms in the background, both drooping together in the breezeless air. The effect is very fine, when considered with reference to its presenting the hardy fishermen under one of their few aspects of oriental repose. The other engraving is quite a different affair: the ship hove-to upon the open sea, and in the very heart of the Leviathanic life, with a Right Whale alongside; the vessel (in the act of cutting-in) hove over to the monster as if to a quay; and a boat, hurriedly pushing off from this scene of activity, is about giving chase to whales in the distance. The harpoons and lances lie levelled for use; three oarsmen are just setting the mast in its hole; while from a sudden roll of the ship, the little craft stands half-erect out of the water, like a rearing horse. From that ship, the smoke of the torments of the boiling whale is going up like the smoke over a village of smithies; and to windward, a black cloud, rising up with earnest of squalls and rains, seems to quicken the activity of the excited seamen.